(February 1, 2019) Over the past half decade or so, the West Coast city of Portland, Oregon has established itself as an unlikely, but very vibrant, soul music city. SoulTrackers know that we raved a few years ago about the Bespeak Love album that collected many of the local stars, and made the world take notice. 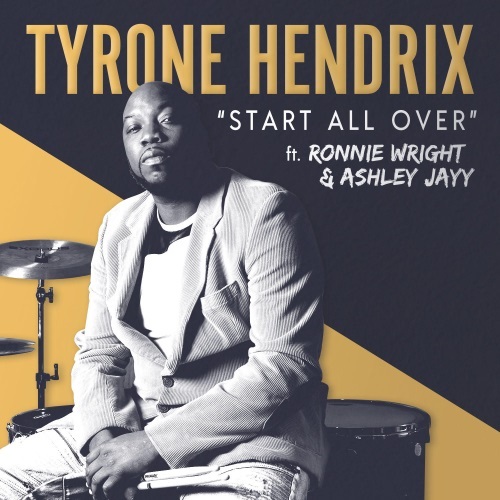 Now, another of the talented musicians from Rip City shows his stuff off, as drummer and producer Tyrone Hendrix has issued the new song “Start All Over,” featuring Ronnie Wright (aka Bespeak) and Ashley Jayy. It is the first single from Tyrone’s upcoming album Rhythm On Life Vol. 2, which features a who’s who of new soul talent, including Jarrod Lawson and Lindsey Webster, as well as legendary saxman Mike Phillips. “Start All Over” supplies a loping, soulful vibe that lets the singers run free, and keeps us grooving in our seats. Check out “Start All Over” and welcome Tyrone Hendrix to SoulTracks!